If you haven't switched to online shopping yet because it seems too much hassle or you like to see before you buy, it might be time to reconsider. Buying food online could be easier than you think, saving you time and money while improving your eating habits. Food blogger Peggy Solomon from A Real Kitchn never considered online grocery shopping until a friend suggested she try it. "It changed my grocery shopping game," she says. She saves up to half the price of her usual grocery shop plus up to four hours each week of her time. Not only does she no longer have to stand in line at the supermarket, reordering from her personal shopping cart makes it easy to click and buy. You avoid buying the temptations as they're not physically in front of you. Solomon has found herself making healthier food choices, too - and curbed impulsive spending and eating. "While previously I would go to the grocery store with a list, I would still grab things simply because they looked good or the display 'made me do it' and I would wind up with items I would never use or need," she says. Recent Nielson research has found grocery e-commerce shopping in Australia has increased by nearly a quarter in the past 12 months, as well as a small increase in spend per trip. The research shows that over the past year the average Australian household bought online on 6.7 occasions, with an average online transaction of $108, up from $105 last year, with steady growth in fresh "convenience" produce and fruit. Sales of heavy items such as pet supplies and beverages showed the strongest growth online, as more customers opted for the convenience of having them delivered to their door. 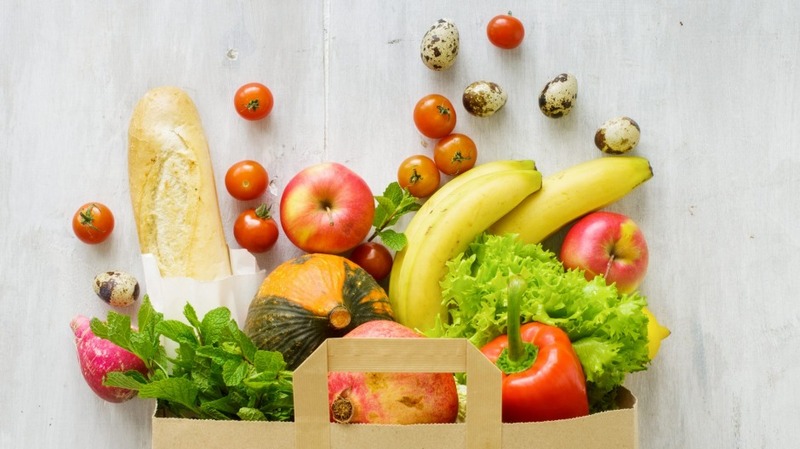 "Online grocery shopping [allows] us to shop for groceries from work, home or while we're on the move," says Michelle Daga, a clinical nutritionist from The Real Foodies clinic and coaching academy. "It eliminates the need for travelling to the supermarket, finding a carpark and long queues during rush hour." Naturopath Chantelle Bell says you can save even more time by eating similar foods each week and saving them as favourites - a great go-to for ordering staple items. "You can see every order you've placed, use search functions and browse by category, all of which allow you to easily find the products you're after," Bell says. "Some online shopping websites suggest recipes, which means you can meal plan and add the already created list of required ingredients to your cart." Daga says meal-planning functions can provide healthy recipe inspiration. "If we're more organised with buying groceries and ingredients to cook with at home, we're less likely to reach for unhealthy home-delivered meals." A new global study published in Royal Society Open Science found people living in Australia, Britain, the US, Canada and India all have one major food habit in common: we all Google takeaway food at 7pm and 2am in our respective parts of the globe, with the most common search phrases being "pizza delivery" and "Chinese delivery". In fact, according to the latest household spending survey by the Australian Bureau of Statistics, the average Australian now spends $80-100 a week dining out or ordering deliveries. In contrast, online supermarkets encourage more health-conscious decision-making, by providing ingredients lists and nutritional panels for packaged items. "It allows you the time to analyse nutritional values by looking up any additives or ingredients you don't understand, and in turn consider suitability in regards to allergies and dietary requirements, and then make informed decisions about whether or not to put that in your body," Daga says. Buying groceries online also means you'll never make the mistake of shopping while hungry. "You avoid buying the temptations as they're not physically in front of you and having only the food available for the meal plan can help keep you on track with better eating habits," Bell says. And for all the parents out there, filling up a virtual cart is easier than pushing a trolley with a small "helper" or two. "The whole reason I began doing my shopping online was to reduce stress levels especially with a toddler in tow," Bell says. "No more tantrums because I said no to the strategically placed surprises at the checkout," Bell says. For all the benefits of online shopping, however, there are a few cons you may want to keep in mind. Daga suggests not relying on online shops for bulk orders or for urgent catering events. "When it comes to fresh produce you can't inspect before you buy, so you have to hope the pickers do a good job for you," Bell says. If you can't make it to a store in person, your best bet for fresh, organic produce is a local online farmers' market or co-op that delivers organic produce to your door, Daga says. There's also the chance you'll receive the wrong item or quantity. Or if a key ingredient you need urgently isn't available, you might have to rush to the shops for a single item, Bell says. Bell's final word of warning? Make sure you don't fall for the "have you forgotten something" page, which appears before you check out. "It's filled with half-priced items you ... may buy in a moment of weakness, messing up your diet and budget."